Don't miss out on our Dance Team workshop! The workshop will be held Wednesday, April 17th in the Dance Room. Registration begins at 3:00pm. Interested in becoming a member of the 2019-2020 SMCHS Dance Team? 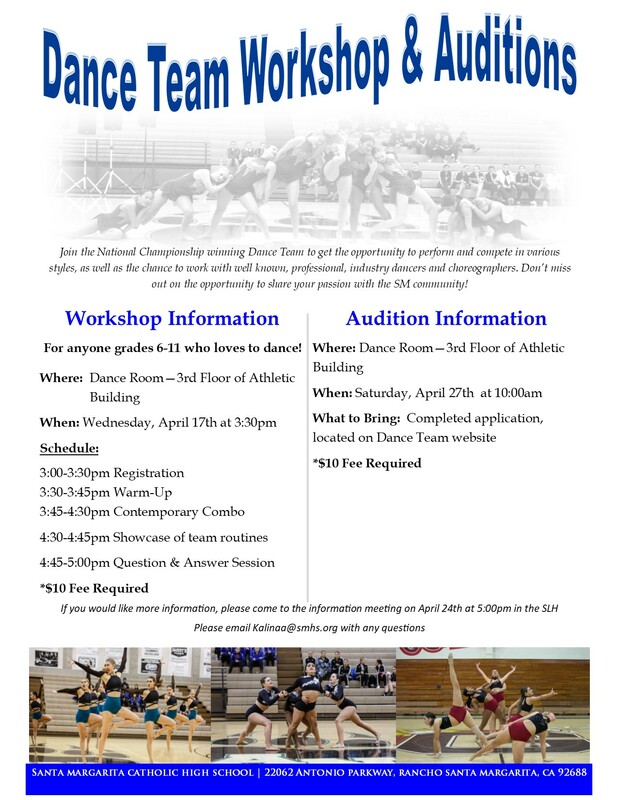 Be sure to attend our annual Dance Team workshop on Wednesday, April 17. Registration begins at 3:00pm. What to Wear: Form fitting and comfortable athletic attire that you are able to functionally dance in. For More information be sure to attend the Dance Team information meeting on Thursday, April 24th @5:00pm in the Science Lecture Hall. If you do not receive a place on the team, but would still like to take a dance course elective, you will be placed in the appropriate class level based off of your Dance Team audition. A yearlong course designed to teach the advanced dance student how to be a better performer, and how to view dance (both live performances and via videos) from a critical perspective. Students must have a solid technical background and experience with Ballet, Modern and Jazz. Participation in the annual SMCHS Christmas Production and the SMCHS Dance Concert are also required. In addition to on-campus performances, these students represent SMCHS at competitive dance team competitions during the winter/early spring. The SMCHS Dance Team is a competitive performance group consisting of well trained, experienced performers who love to dance. An academic program within the Performing Arts Department, the dancers receive academic credit that is UC approved for their class work, as well as PE Credit for 8th period rehearsals. Arielle Kalina began her dance training at the age of 6. She studied jazz, lyrical, tap, ballet, and hip hop at many studios in Southern California. Arielle continued her training, earning her BA in Dance at California State University, Long Beach where she studied jazz, ballet, and modern. Arielle performed, as well as choreographed, for various shows while studying at CSULB. She also performed and competed with the nationally ranked Long Beach State Dance Team for three years, as well as performing with the Black Eyed Peas at the 2010 Kids Choice Awards. Arielle was also a member of the Pace Elite International Competition Team, with whom she is a two time Dance World Champion. Arielle looks forward to pursuing her dance career while sharing her passion for dance with her students. Deja Pelayo began her dance training at the age of 4. She trained at many studios across Orange County in the styles of jazz, lyrical, contemporary, hip hop, ballet, and tap. She was also apart of the SMCHS Dance Team throughout all her years of high school and was named Captain her senior year. Deja continued to study dance during college, but ultimately graduated with a Bachelor’s Degree in Psychology. She performed as a background dancer for the band Irontom in a music video named “The Minista.” Recently, Deja traveled to Switzerland & Paris with a group of dancers to compete in a worldwide dance competition. Currently, she is teaching and choreographing for various studios throughout Orange County. Deja plans to share her love, dedication, and knowledge of dance with the SMCHS Dance Team. What are the requirements for making the team? Although there are no specific requirements, most dancers are expected to be at an intermediate/advanced technical level. Dancers will be asked to perform turns, leg extensions, and various leaps. The judges are also looking for their individual style and performance through the contemporary combination they will learn. What is the time commitment as a team member? Dance Team practices up to 3 times a week after school, depending on how many dances each member is in. The schedule rotates weekly, and every dancer is expected to keep those 3 days open. Dance Team attends 7 competitions throughout the season. In March the team takes a 5 day trip to Florida for Nationals. The team is expected to perform at 2 football games, 1 basketball game, all Open House's, 8th grade visitation, etc. As a Dance Team member do you receive P.E. credit? Yes. If you are a 4 year member of the team you will recieve Fine Art and P.E. credit. Dance Team Achieves Success at USA Nationals!